The official measure of a chilli’s heat is the Scoville Heat Unit (SHU). Originally this was calculated by testing the number of drops of sugar water required to make the heat from one drop of the chilli undetectable to the human mouth; nowadays things are bit more scientific and measurements are usually made using high-performance liquid chromatography (HPLC), but still the Scoville Heat Unit is the unit of measure. Wilbur Scoville was an American chemist and pharmacist, known for having created, the SOT (Scoville Organoleptic Test), in 1912, a test to measure the amount of capsaicin in a chilli pepper. This led to the creation of the Scoville Scale which measures the hotness of a chilli pepper. Originally the S.O.T. took an alcoholic extract of capsaicin oil obtained from a dried chili which was diluted with water and sugar until the sensation of “burning” was no longer perceptible to a set of five tasters. To be rated three out of five people had to agree on the assessment. A single unit of dilution is called SHU (Scoville Heat Units). Scoville gave pure capsaicin the arbitrary value of 16,000,000 SHU as the maximum degree of dilution on the Scoville Scale. In summary, a bell pepper, which contains capsaicin, has a value of zero on the Scoville Scale, indicating that the extract of a sweet pepper is not spicy and you do not need to dilute it. Being natural products that are cultivated under different environmental conditions, chillies of the same variety will not have the same SHU heat. It is simply the maximum value registered and officially recognised. The S.O.T. however, had a very large margin of error as it was dependent on human subjectivity. Other types of tests have been developed that are much more sophisticated and precise. HPLC (High Performance Liquid Chromatography, also known as “Method Gillette”) is done by a modern machine that directly measures the amount of capsaicinoids which is then converted into unit of hotness “ASTA”. These are then converted into Scoville units, 1 unit ASTA is equivalent to 15 Scoville units. This conversion is still approximate since the HPLC test has an error of about 12%. 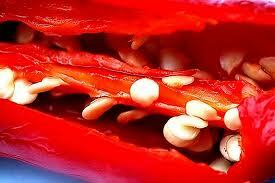 Pure capsaicin is a toxic substance, and if taken directly can cause death by respiratory arrest. That said the amount required for ingestion to cause the death is thirteen grams, equivalent to a couple of tablespoons. Chilli heat levels can vary greatly due to climatic conditions, growing methods and time of year (ripeness) – from ‘disappointingly cool’ to ‘surprisingly hot’! Different people have a different perception to heat of chillies (thermoception). Additionally, due to the complex compounds that make up the heat in chillies and the way different people’s senses of heat, smell and taste react to them, it is not uncommon for people to find some varieties feel hotter than they actually are – i.e. they might find a Hot Wax hotter than a Cayenne when it should be the other way round. It is a ‘half truth’ that leaving the seeds of your Chillies in will make the fruits hotter; the seeds themselves contain absolutely no capsaicinoids (the active heat ingredient) – but the placental tissue that holds these seeds in position does. So removing seeds and the tissue that holds them in place will reduce heat, but if it were physically possible to remove just the seed without the placental tissue it would make no difference at all. Accordingly we always recommend you exercise caution when picking and tasting your crop for the first time, or when fruits have been allowed to mature further.